A petition calling for a bus service to be saved has been sent to county hall. Passengers who use the 114 Preston to Chorley bus fear it will disappear if Lancashire County Council – under proposed budget cuts – withdraws all funding for subsidised services. The Preston Bus-run service has become a vital lifeline for folk in villages such as Whittle-le-Woods and Clayton-le-Woods. They see it as ‘a community bus’ where folk meet and chat and swap books and jigsaws. Preston Bus, in an open letter to passengers, warned of the consequences of the cuts, which it says will affect the entirely subsidised services 12, 12A, 13, 75 (A), 112 and 114. MD Bob Dunn wrote: “These cuts will reduce the viability of travelling by bus for many, from those living in Preston wanting to travel late at night, or those in rural villages, which will be left completely isolated. 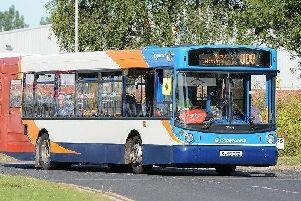 Preston Bus is urging people to object to their MPs and local councillors.